An access key for account creation/upgrade. Access to the Player versus Player portion of Guild Wars® only. Does not include the Guild Wars® roleplaying content. 60 free unlocks (20 elite skills, 20 normal skills and 20 items). 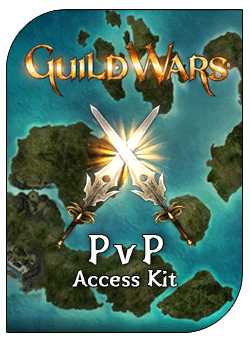 Gain instant access to the Player versus Player portion of Guild Wars® with the new PvP Access Kit. This package contains everything you need to jump right into the competitive world of Guild Wars® PvP! No other Guild Wars® purchase necessary.